OUR MISSION IS TO ADVANCE HEALTHCARE THROUGH EDUCATION, SCHOLARSHIP, PRACTICE AND SERVICE BY PROMOTING EXCELLENCE, CREATIVITY, INCLUSIVITY AND ENGAGEMENT. Outstanding leadership in nursing education, scholarly inquiry, and healthcare innovation to improve regional, national, and global health and healthcare delivery. Excellence: Guided by our commitment to excellence, we exhibit integrity and caring and strive for outcomes that make a positive impact on the health of individuals, families, and communities. Inclusivity: Guided by our commitment to social justice and respect, we strive to engage in research, learner-centered education, and nursing practice that supports diversity. Engagement: Guided by our commitment to engagement and collaboration, our work is interdisciplinary and supports local communities, and regional, national and global partners. 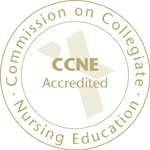 The baccalaureate degree in nursing and master’s degree in nursing programs at University of Delaware are accredited by the Commission on Collegiate Nursing Education, One Dupont Circle, NW, Suite 530, Washington DC 20036, (202)887-6791.